Melbourne Town Hall created in gingerbread is just one of the many icons replicated. All images courtesy of Epicure. Melbourne's Town Hall is already decked out for the Christmas holiday season and the iconic annual Christmas Gingerbread Village on display within Town Hall is now open for public viewing. 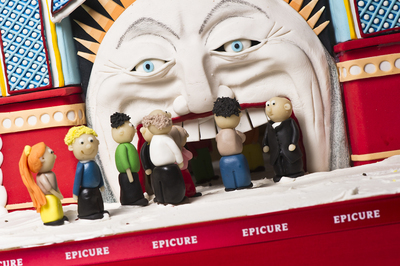 Baked up by Epicure's executive pastry chef, Deniz Karaca and his team of 12 volunteers, the sweet construction is on display until Wednesday, December 24, with donations benefiting the Make A Wish Foundation. Executive pastry chef Deniz Karaca and the iconic MCG. Now in its fourth year, the Gingerbread Village by Epicure has returned to the Melbourne Town Hall delighting both the young and younger at heart, right through until Christmas Eve. 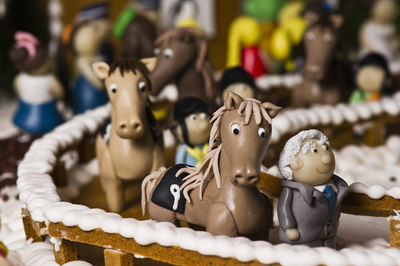 At the 2014 Gingerbread Village you'll see some very recognisable landmarks including the Melbourne Town Hall (complete with the Lord Mayor), Melbourne Cricket Ground, Luna Park (with the roller coaster included) and a zoo featuring all kinds of remarkable mini animals, all connected by the Christmas train. New to the installation this year is Flemington Racecourse, including its iconic grandstand and complete with horses, jockeys, racegoers and a few cheeky surprises! A host of fun and mischievous characters are worth exploring in detail, and complete a scene that captures the true essence of a magical Christmas. coin donation. This year, proceeds go to Make A Wish® Australia, and so far almost $50,000 in generous donations has been raised via the exhibition. 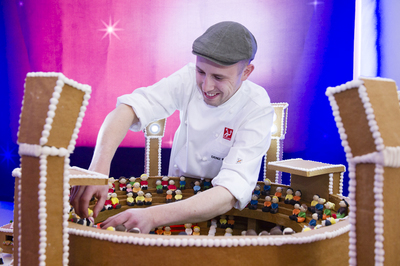 Award-winning pastry chef Deniz Karaca says it's an initiative his team looks forward to each year and includes baking over 500 kilograms of gingerbread, using 300 kilograms of royal icing and 120 kilograms of marzipan. The display also includes about 800 miniature Christmas trees to creative the festive backdrop. Constructing the village takes over 2,000 hours of work. 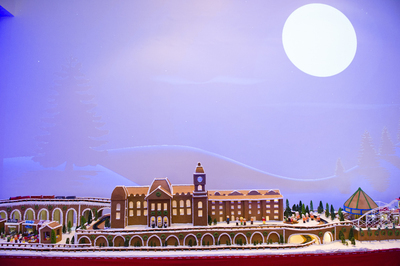 Epicure's pastry chefs have also baked up delicious gingerbread treats available for purchase! Whilst devouring the village itself may be tempting, it is not encouraged! This looks amazing- what wonderfully talented chefs!